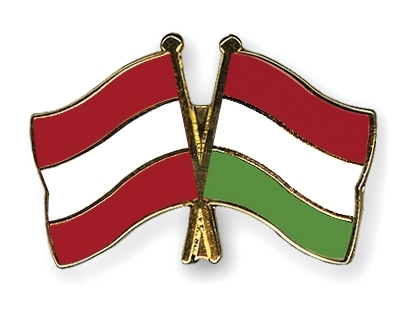 The above illustration shows a Crossed Flag Pin with the Austria flag on the left and the Hungary flag on the right. Friendship Pins are also available in the reverse grouping of flags: the Hungary flag on the left hand side with the Austria flag next to it. Crossed Flag Pins: Austria-Hungary, size approx. 22 mm, hard-enamel, gold-plated, with butterfly clutch, in individual packaging. Friendship Pins with customized designs using virtually any combination of flags can also be realized. If you are interested in Friendship Pins Austria-Hungary please contact us with the following contact form - we will make you a special offer! Please send us your request for quotation, our sales team looks forward to hearing from you.